The lira has risen against the dollar after Turkey's central bank hiked interest rates to 24% on Thursday - the biggest increase in President Tayyip Erdogan's 15-year rule. The lira is down 38% against the dollar this year despite Thursday's slim gain. The move came despite Mr Erdogan repeating his opposition to high interest rates earlier in the day. He has repeatedly blamed the central bank for high inflation, which hit almost 18% last month, its highest level since 2003. Mr Erdogan, who has called himself an "enemy of interest rates", chose his son-in-law, Berat Albayrak, as finance minister in July. Phoenix Kalen at Societe Generale said the market was both pleased and confused by the bank's move. "It almost seems like it's a game of 'good cop, bad cop' being played out between the Turkish authorities - with President Erdogan on the one hand still making statements regarding his dislike of interest rates and... a very sizeable reaction from the central bank in response to the recent inflationary and geopolitical developments," she said. Piotr Matys at Rabobank said Turkey also needed to resolve its trade dispute with the US and rebalance the economy away from big infrastructure projects and consumer spending. The central bank surprised investors by not raising rates when it last met in July. That decision sent the lira tumbling by a quarter and prompted Turkish authorities to impose a series of measures intended to support the currency. 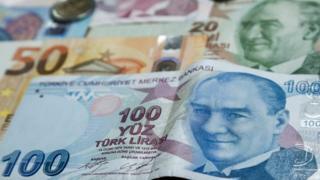 On Thursday Turkey banned the use of foreign currencies in the country's property market. Could crises in Turkey and Argentina hurt Asia?